I have finally written out a pattern for the chevron scarf I knit ages ago because a few people have been asking me about it. It’s really simple even though it looks quite complicated. Kfb: increase one stitch by knitting in the front and back loops of the same stitch. Psso: pass the slipped stitch over the last knit stitch(es). Row 1: k2, *kfb, k4, sl1 knitwise, k2 tog, psso, k4, kfb; repeat from * twice, end with k2. Row 2: k2, p39, k2. Rows 2 and 3: do chevron stitch pattern. Row 4 onwards: repeat chevron stitch pattern until happy with the length of your scarf, ending with row 1 of chevron stitch pattern. Note: I used six colours and did six rows of the chevron stitch pattern in each colour, except the light green where I only did two rows. Great pattern – I am looking for something easy & unique so I will give this a try….tonight. Love it! One question though. I counted the stitches between asterisks and come up with 13, so should that section repeat three times rather than twice? I’m having trouble with this, I cast on the 43 stitches, knit one row, but then when i go to do the next row i always end up with extra stitches left over, any suggestions on what i could be doing wrong? Hi. I was wondering if this particular knitting pattern had a name and if you could maybe post a video up? It would be extremely helpful. I am trying to knit a scarf for a friend, and so far, this is my favorite pattern. I hope I can do this pattern does row 4 mean that you just continue with the chevron stitch pattern? Thanks for one’s marvelous posting! I genuinely enjoyed reading it, you are a great author.I will make sure to bookmark your blog and will eventually come back in the future. I want to encourage you to ultimately continue your great writing, have a nice holiday weekend! awesome! thanks. My LO asked for a zig zag scarf this morning, this is the one that ticks the boxes. I am almost finished with this scarf which will be a gift for my daughter. Is there a way to bind off in the ripple pattern? It looks like the last row will be flat rather than rippled. I have enjoyed knitting this and I thank you for the pattern. I am a new knitter. in row 2 of chevron stitch pattern, what does p39 mean? I just finished knitting this scarf. P39 means, “purl 39 stitches.” Once I learned the pattern, it went well. I think there’s an error in the decreases. Should be (sl2tog k1 psso) instead of (sl1 k2tog psso). That gets the centered decrease shown in the picture. Once I fixed that, I love this 🙂 Very easy to read my knitting and remember the pattern for start and stop knitting at work. Row 2 the first time u do the chevron pattern there’s not enough stitches. Casted on 43 but I think you need 51. I’m confused. After which row add a new color?? Is the pattern repeat 13 +4? One place says you switched every 10 rows one says 6…Looks like 6 rows to me of each color correct? Also is 43 stitches too wide? I dont’ want more than 6 inches wide. Thanks. 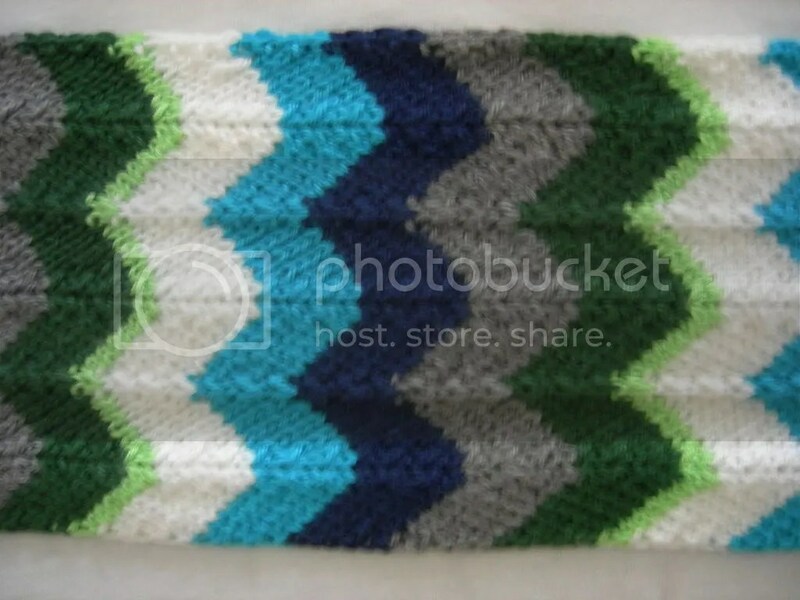 I am excited to make my first chevron soon. It’s remarkable to pay a visit thіs web paɡe and reading thе vidws of all friends аbout thiss piece of writing, ԝhile I aam also zealous of gеtting know-һow. What I suggest by this is that I regularly see gamers become livid after a bad beat.